Product Description:- The fingertip Pulse Oximeter is a pain-free, fast and easy way to measure the amount of oxygen in your blood and your heart rate. It's perfect for measuring your target heart rate while exercising, or can be used to check on little ones with respiratory problems/infections. The Fingertip Pulse Oximeter makes a useful gift for an athlete, new parent, respiratory illness sufferer or health care provider in your life. 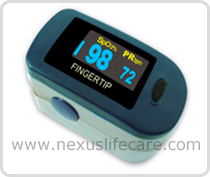 Pulse Oximeter has a compact design and single button operation, LCD NightVision backlight display with 6 display modes, Displays SpO2, PR, bar graph and SpO2 waveform (pleth or line), PR audio recognition function, Pulse signal strength, Low voltage indicator and rechargeable batteries, Ten levels of adjustable brightness and automatic power-off function.